February 1st is "No Politics" Day ?? February 1st is “No Politics” Day ?? 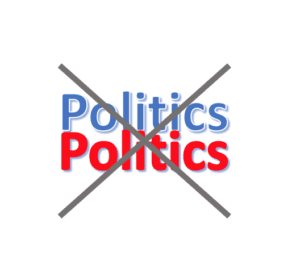 I read something this morning that indicated February 1st is “No Politics” day. Now, of course, this has to be a made-up holiday of some sort, but let’s just go with the idea for a moment. Every single day, there are political posts on social media. There is always at least one news item, but usually many, surrounding some sort of Democratic or Republican issue. There are the us-versus them-discussions. There are the hate-him, love-him debates about our current president. And there are the mind-boggling politicizing of non-political stories. For example, climate change is a scientific topic, but it has now become political. 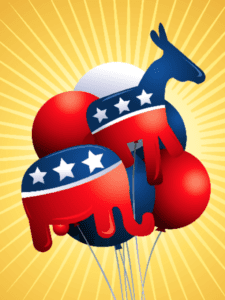 Politics have wiggled their way into just about every aspect of American society. I log onto Facebook and see posts about real life. Friends who are releasing new music. Another who has overcome an obstacle. Something new that has been discovered or invented. A new way to get exercise. Some new food discovery. Tips on how to grow a garden. Birthday announcements. Birth announcements. Lots of things to “like” and comment on. Then I switch to Twitter and I log in and see links to motivational speeches. I see information about how we can improve our environment. Oh, and there is an announcement about a great new book that is being published. And an interesting house that is going on the market for sale. A new scientific study about the universe. A new cholesterol finding. A great TED talk. Lots of interesting things to check out. I turn on the news and there are factual reports about what is going on in the country, none of which blame a political party for something. Everything I hear describes the who, what, where, when, how, and why (when the last part is a fact). There is no conversation about what the left or right think. There are no opinions. In fact, the news only comes on for a half hour, and then again later in the day for another half hour. The way it used to be. The 24×7 news-tainment shows are off the air for this day. Then I run outside to get today’s newspaper and it’s full of sports news, with some in-depth reviews of team statistics. There is information about what is going on in the world. Russia did such and such. China did such and such. The UN discussed such and such. This disaster or that disaster happened. The stock market did this or that. But nowhere is there a link to politics. Just for this one day, political discussions and inferences are banned. The level of dissatisfaction with life decreases, and positive thoughts increase. What actually happened is I logged onto Facebook and the first thing I saw was about a Democrat who wants to run as an Independent in 2020, and commentary about whether that was a good thing or not (along with the comments about how the guy knows nothing, just like some past president). I logged onto Twitter and one of the first tweets was about yet another person jumping into the 2020 Presidential race. I logged on to a news site and on the first page were headlines including the words “dirt,” “insults,” and why one party doesn’t want election day to be a holiday. And this morning’s newspaper started with all the political shenanigans going on in the country right now. And then I wrote a post about politics. There seems to be no escape. So is February 1st No-Politics Day? Evidently not. And that’s too bad.